35th National Games Kerala will be held from 31st January to 14th February 2015. The 15 day event would be attended by 11,641 participants, including 7,744 athletes. The games will be held across the seven districts of the state. 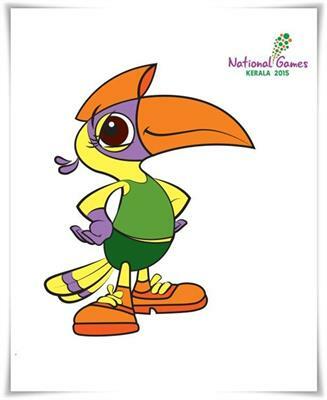 Ammu, the Great Hornbill, being the mascot for the 35th National Games will be the main attraction from the days to come. Read more to know about the 35th National Games slated to be held in Kerala. The countdown of the most exciting event – 35th National Games has already begun. Having a legacy of contributed a number of National and International sports personalities, the state is gearing up to utilize the opportunity to show its pomp and diversity by building up the best infrastructure and facilities to meet the international standard. More than providing a great impetus for Indian sport in the years to come, the event would open doors for the tourism development in the state. The National Games slated to be held from 31st January to 14th February 2015 will be attended by 11,641 participants which include 7,744 athletes. The venue of the games is set across seven districts of the state. Ammu, the Great Hornbill, being the mascot for the 35th National Games will lead the campaign proposed to be beginning in few days time. On 29th August, the National Sports Day, colourfull programmes are being arranged at Thiruvanathapuram, state capital. More than a Flash mob, cultural procession on 6th August 2014 to be held for the 62nd Nehru Trophy Boat Race in Alappuzha is being planned to conduct more showiness. Kerala is gearing up to unleash an extensive publicity campaign to make the biggest sporting event more exciting. Some of the inventive programmes include Mass runs, skits and a Torch Relay. The cornerstone of the campaign in the state would be the 'One Crore Run'. According to the plan, a mass run will be organized across the state involving 1 Crore people including dignitaries and celebrities. Ammu, the mascot has been visiting schools across the state to give awareness about the important ace of sports apart from apart from raising awareness on the upcoming national event. To develop the sports infrastructure, Rs 600 crore is expected to get as investment. The construction of the nine new stadiums of international standards is on the way in different parts of the state. Meanwhile the upgradation of a number of existing facilities which include two swimming pools and seven indoor stadia is fast progressing. With an estimated budget of Rs 611.3 Crores, the state is hosting the event after a gap of 27 years. The Games Village' to be build with a budget of Rs 60 Crores would accommodate 5000 sportspersons at a time. A squash court, shooting range and hockey turf are also being developed in view of the games. A 'Green Field Stadium' at Karyavattom, a mammoth sports complex will be the flagship project being implemented in connection with the National Games. The state's first squash court was almost completed at Chandrasekharan Nair Stadium at a cost of Rs. 4.17 crore. As a part of the Games, the state will be getting a large number of internationally certified stadiums which can be utilized properly to revive the sports aspirations of young talents. Adding more to it, the upcoming event will also help the state to host various national and international events in future.